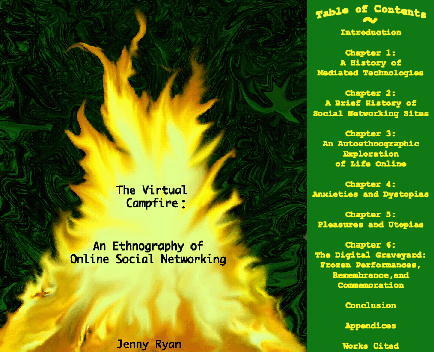 Ethnographic study: Social network sites are "virtual campfires"
In her thesis, she proposes that everyday involvement with these sites can be metaphorically represented as a “virtual campfire” that “bridges the gap between the place of the hearth and the space of the cosmos, potentially reversing what has been called “the disintegration of the public sphere” (Habermas 1962: 175). Thousands of years ago, our early human ancestors gathered around campfires, creating communal hearths of warmth and light. There they might tell stories, converse about the day’s events, perhaps engage in shamanistic rituals involving plants, music and dance, or simply gaze silently at the flames in collective meditation. Today, the fireplace in my family’s living room shares its centralizing power with the television, around which we gather with our laptops and cellphones by our sides. Our time spent together is increasingly mediated by new technologies, enabling new forms of storytelling, altering our processes of individual and collective identity formation, and extending the possibilities for creating and maintaining social relationships. My central argument in this thesis is that online social networks can potentially serve as both places of the hearth and avenues to the cosmos. Over time, these sites function as personal records of one’s experiences and relationships. These archives are made up of a variety of forms akin to older modes of record keeping, such as address books, journals, diaries, photo albums, personal correspondences, and yearbooks. Additionally, they serve as gateways to the greater milieu, enabling the circulation of information about the world and granting members the capacity to participate in various ways. For teenagers and marginalized groups, in particular, these sites can be safe spaces for exploring and experimenting with identity, as well as for connecting to new people and ideas. Ryan plans to add interactive features to the website version of her thesis, maybe she’ll turn it into a wiki, she writes in her blog. Why anthropologists blog: Blogs more interesting than journals? Another way of doing fieldwork: Developing websites with your informants!